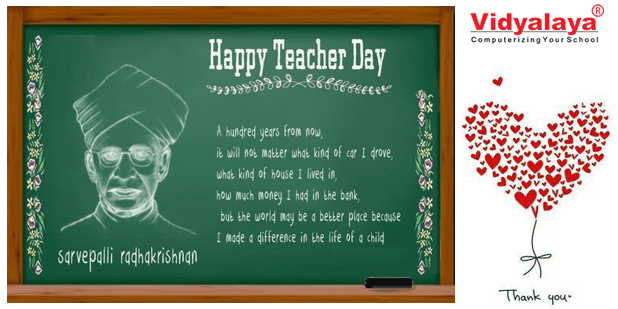 Happy Teacher’s day Guys…! We always think of a teacher or a guide who protects us from each & every problem of ours. Dr. Sarvepalli Radhakrishnan well said that “When we think we cease to know”. Appropriate and easy to understand right? They said that experience is the best teacher & also what you learn to form it, is a lifetime lesson. When the word comes teacher, we all have great memories of school so let’s go back to school days where our teacher always guided us. When I was in school we had a lot of fun with our teachers and the way they scolded us was the best part. What’s yours remember? Yes, then just wish them, who guided you, who gave you the opportunity to learn, who made your strengths more powerful, who trusted you when no one did, who smiled at your mistakes. We all made mistakes but on that grounds just our teacher oversees it. Education Imparted us where to stand. Based on it we are gifted with “GURUS”. A guru is a doctor who heals ignorance & an artist who inspires creativity. It makes them do work on eternity & don’t know where their influence stops. Becoming a teacher involves taking some responsibilities for the process of enabling people. Therefore it’s an extreme form of commitment to the well-being of other. A good teacher is like a candle, it consumes itself to light the way for others. On the path where each of the criteria follows in life, a teacher is one who enlightens it. I often reflect on the similarity between a teacher & a flower. It blooms to give happiness to others. For the most important thing about an educator is sharing. Teacher in the role is a method of teaching that utilizes techniques of drama to facilitate. They Encouraged, they cared, they helped, they expected, they inspired, they scolded, they punished, they understood, & at last, they taught.